Last summer I traveled to Kenya as part of a UN Foundation/Every Child By Two delegation to ensure access to vaccines throughout the globe. While there, our delegation traveled to a remote village to meet a little boy named Job Alphonse, who had recently contracted polio along with his sister and brother. Sadly, Job’s mother confided that she had not vaccinated her children at the guidance of her former spiritual leader. While three of her children had contracted polio, only Job’s case had caused permanent paralysis in his legs. The community health nurses and UN staff explained that the family’s cases had galvanized Kenyans to conduct intense vaccination efforts to stop the spread of the disease in what was once a polio-free country. It was heartwarming to meet families throughout the country who are truly grateful for the life-saving vaccines provided to their children, as well as the dedicated community volunteers who walk for miles to ensure that not one child is left without protection. Witnessing these efforts truly solidified my commitment to raising awareness of the need to support global vaccination efforts. Today, the vast majority of the world is polio-free. Nearly 80 percent of all polio cases are concentrated in just one country: Pakistan. The two other remaining polio-endemic countries – Afghanistan and Nigeria – continue to show progress. Nigeria has decreased polio cases by 87 percent and Afghanistan has recorded fewer than 10 cases of this devastating disease. 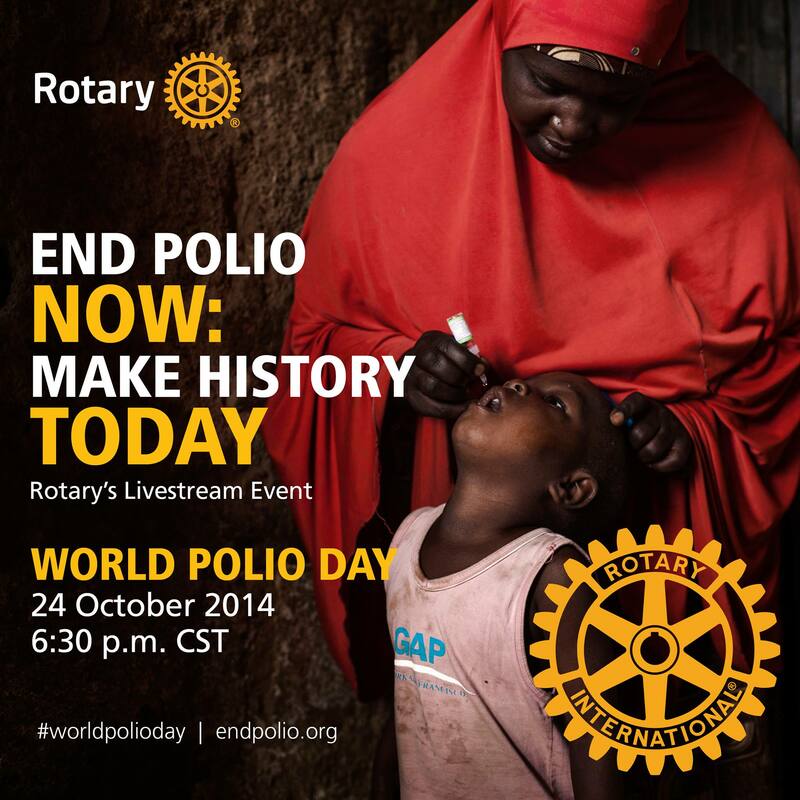 Tonight I am proud to be taking part in Rotary’s World Polio Day Livestream Event at 6:30 PM CST. During the event, viewers will receive an update on the status of polio eradication, featuring Global Polio Eradication Initiative partners, celebrity ambassadors, polio survivors and special guests. Please join me tonight to learn how we can all take action to help eradicate this disease from the face of the earth! Reblogged this on The Polk County Immunization Coalition. Thank you Amanda for all that you’re doing! It’s heartening to see a celebrity fighting FOR science and modern medicine. You are helping to make a difference. Almost there! All the best to Amanda & the teams out there working for final eradication of this disease!!!! Aren’t the only cases of Polio in the US from the vaccine itself? I heard the last cases of wild Polio here were reported around 15 years ago? Is this true? @kim – there are no more polio cases in the US (or in 99.9% of the world). Thanks Lawrence! So no reason to get the Polio vaccine then. @Kim – you should have already received it….but if things work out & this disease is finally eradicated, no one else in the world will need to get the vaccine again, ever. http://www.google.com – honoring Dr. Salk today and he’ll be honored again when his vaccine is made a part of history. I did, but i was thinking about my future kids. @Kim – if the anti-vaccine brigade gets out of the way, we can send Polio to the trash-heap of history & make it only the third disease ever (Smallpox & Rinderpest were first and second) that we’ve managed to eradicate. Even today, volunteer health workers in Pakistan & Afghanistan are risking life and limb to complete the eradication campaign – all my thoughts and prayers are with them to keep them safe. Kim, at such time as polio is eradicated worldwide, polio vaccines will be removed from the recommended routine vaccination schedule, in exactly the same way that the eradication of smallpox caused smallpox vaccination to be removed from the schedule. That isn’t the case at the moment, however: polio remains endemic in Afghanistan, Nigeria and Pakistan. if you’re truly concerned about your future children, you’ll ensure that they remain up to date with all recommended routine vaccinations. Or just not have any children. That is one way to positively prevent them from coming to any harm. Since even though there has been no American polio cases in years, it is still possible that they will encounter someone who has flown from one of the places where polio is still endemic.